Just imagine for a minute that The Sims was real life - no, bear with me. Now imagine that, like The Sims, you could solve just about any house problem through one easy-to-use portal. That's how Amazon sees the future. 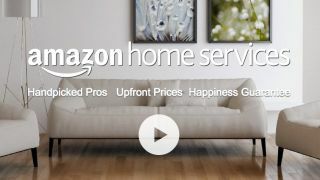 The retail behemoth has just opened the doors to its Home Services store (US-only right now), offering assistance for a vast range of things at just the click of a button. Those options range from the sublime to the actually quite useful. Snow removal, hedge trimming, patio assembly - these are all things that we can see a lot of people taking advantage of. But some of the services on offer are, quite frankly, a tad more niche. Things like goat grazing, for example. Yes, Amazon has a whole section of the site dedicated to Goat Herders (beta, apparently) where you can answer important questions like "What's the primary type of vegetation on your land?" (Grassland, March, Shrubbery, Woodland, Other) and "Approximately how many acres of land do you need grazed?" before someone is sent out to resolve your goat-shaped dilemma. Or if your goat herding needs are already being satisfied, perhaps you'd like to hire a silk aerialist instead. "Goats and silk aerialists are where we need to be right now," is perhaps what some suit said at an Amazon meeting. We also like how the picture for 'Fly Treatment' is just a picture of a swatter, suggesting Jeff Bezos might just come to your house and start angrily whacking at the walls. The actual service will be a lot more thorough than that, promises Amazon. Other favourites from the catalogue include pool table assembly, baker's rack assembly, game console setup (pretty straightforward, really), and, err, maths lessons. Though we joke about some of these, the Uber-fication of some services will surely cause concern for a lot of people. Amazon is going to be offer painters, decorators, plumbers, a removal service and even "bed bug consultation" at the click of a button. Welcome to the future. Would you like to start your 30-day trial?